[Previously, on randomnoun]. This post is a followup from my earlier entry on the trials and tribulations of getting solar panels hooked up to my house in Red Hill. a Solar Inverter. Mine is a Growatt 3000TL 3kW inverter (or something that looks very similar to it) which was installed as part of my TVS solar panel install, which I’ve gone into in more detail here. If you’re anything like me, your Windows XP laptop (and it has to be Windows XP), is in that sweet spot between being too old to have bluetooth, and too young to have actual physical COM ports, in which case you’ll need to grab a couple of usb adapters to provide those things. Get the cheapest ones you can find from ebay , and then be amazed when they’re not recognised automatically when you plug them in. Neither of these so-called XP-compatible devices come with drivers, so what I did eventually was to install an old trial version of the BlueSoleil bluetooth stack (limited to 5MB data transfer), and the driver for the HL-340 chipset serial adapter from some random website (after finding some instructions on this forum post). You may find the usbview utility from FTDI helpful when scouring websites looking for anything vaguely useful. 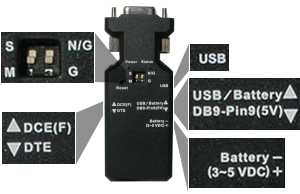 (usbview gives you the Vendor:Product IDs of all USB devices attached to your system; the devices above for me were listed as 1A86:7523 and 0A12:0001) . 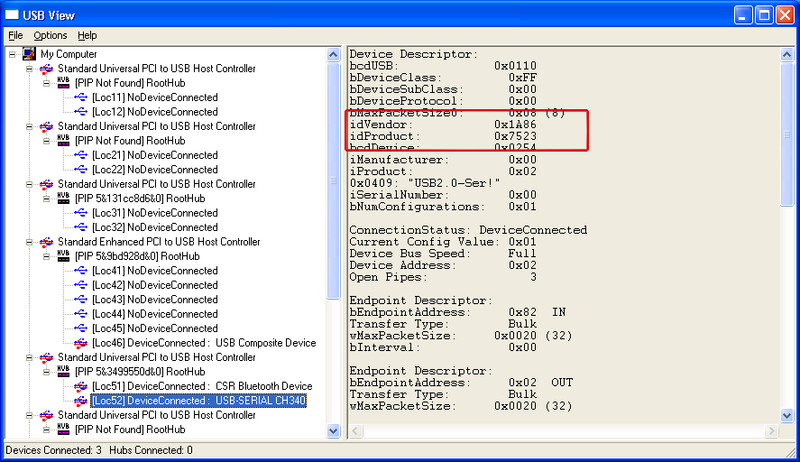 Once you do that, go into Device Manager and take note of the COM port assigned to the Bluetooth and DB9 USB adapters. 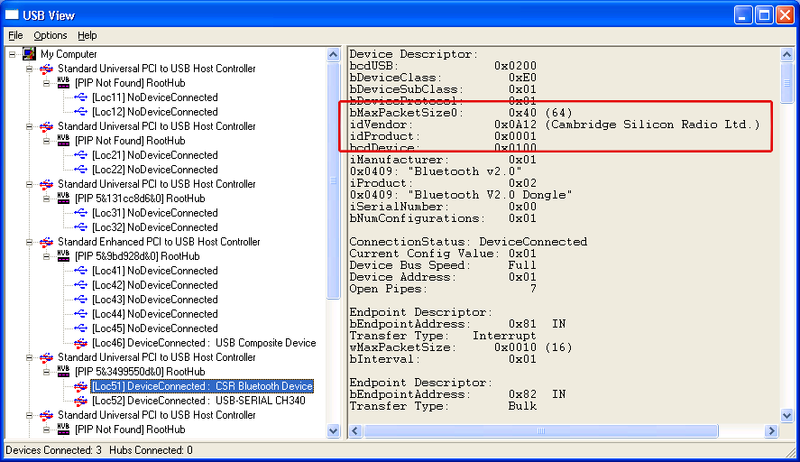 On my laptop, the wired DB9 adapter is attached to COM24, and the wireless BT adapter takes up COM ports 11 to 23. You might want to pair up a bluetooth device that you know works, just to prove that the device driver is functioning correctly. I used some headphones. 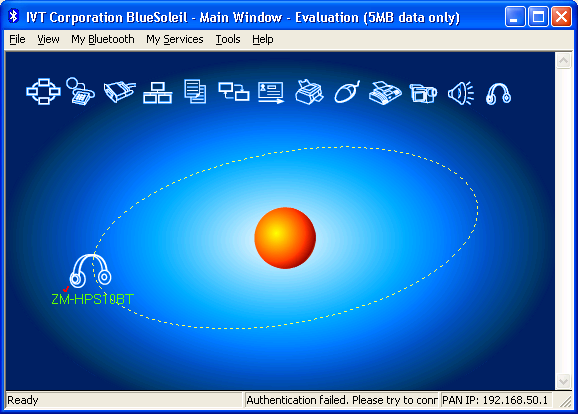 From top left, Bluetooth USB device in usbview; DB9 USB device in usbview; BlueSoleil after detecting a bluetooth device; Device Manager showing BlueSoleil COM ports and DB9 USB COM ports. Click to zoom. ShineNet is the truly awful software package created by Growatt to track solar energy collection from the array of PV cells on your roof. So awful, in fact, that they’re no longer providing it via their website, and any requests to their eight different contact email addresses will fail to get a response from them. What you might want to try doing is sending pleading emails every week or so to people who mention that they’ve installed ShineNet on the solar software section of the whirlpool forum, and hope that someone responds. There are two types of ShineNet in the world, v1 and v2. This link will give you v1.2, which for the purposes of this entry is actually v1. Yes, there are other software packages that profess to comprehend modbus (used by v2) and the proprietary protocol that v1 uses, but I thought it would be slightly less time consuming to use the software made by the manufacturer of the inverter first, before hooking up something with more bells and whistles (controlled by DMX, I’d imagine). This was the ‘simplest possible thing that could work’ configuration I thought I’d try first. Unscrew the coverplate on the bottom of the inverter, plug in a cable, and throw that through the closest window. Whilst your outside, knock on your inverter a few times to set the COM port to anything other than the default “MOVE” setting (e.g. “COM1“). On my inverter, they were too cheap to put two actual buttons on the thing, so you navigate the LCD menu by knocking once to change menu items and knocking twice to select things. I suppose I shouldn’t knock it, it works. Luckily I come from the school of hard knocks. It’s not as if this thing is on Fort Knox. That’s the last knock-knock joke. Etc. Go back inside and attach the cable to the USB->COM DB9 adapter connected to your laptop. 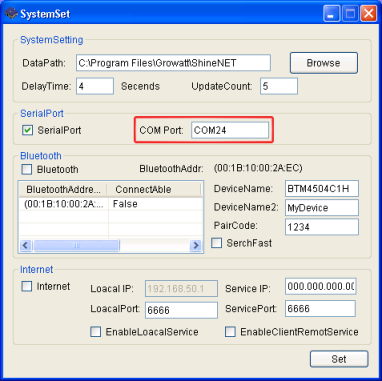 Fire up ShineNet, from the main menu select SoftSystem -> System Set, set the COM port to the value shown in Device Manager for your USB->COM DB9 adapter and click Set. The aesthetically-challenged ShineNet application, and a close-up of the garish chart showing energy production this morning. It will probably help if you do this during the day, otherwise your inverter will probably be in shutdown mode due to the lack of photons in the air. In an ideal world, you wouldn’t have a cable permanently hanging outside of your house, so let’s try running this over bluetooth. What I’m attempting to do here is to transfer data over the air between the two bluetooth devices which are now plugged into the same laptop (if your laptop was made in the last 5 years, you probably have bluetooth built in, and don’t need the second adapter above). It may be easier to use a separate laptop to connect to, if you’ve got access to one. the USB/Battery / DB9-Pin9(5V) toggle switch is pointing to USB/Battery (and you’ve got the adapter powered by a mini-USB cable). If it’s powered up, there should be some red and blue lights flashing on the thing. which probably means the adapter isn’t plugged in, or something else is loose, or it’s not powered on, or you’ve selected the wrong COM port, or you’re looking at the wrong laptop, or your keyboard doesn’t work, or the serial port driver doesn’t work, or the serial port driver isn’t configured correctly, or the operating system has crashed, or something else entirely, or some combination of those things. Try shaking it and trying again. Now in BlueSoleil (or the native Windows Bluetooth device stack, if you can manage to get that working), search for your BlueTooth/DB9 adapter using the other bluetooth adapter (it should appear with the NAME you assigned above). You might want to try this from a completely different machine if you like, since this is testing BT<->BT connectivity. Pair with the adapter (using the PIN you entered above), and then allocate it a COM port. 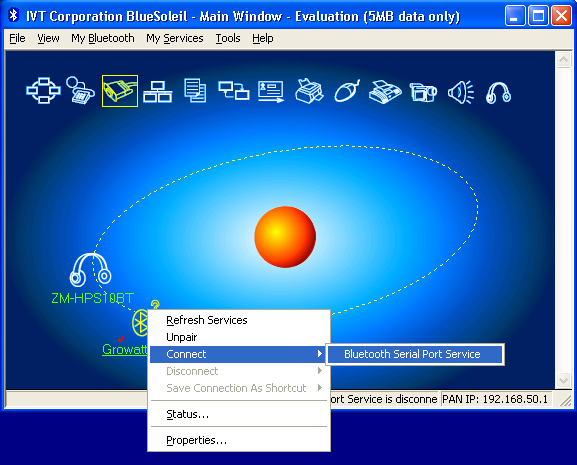 On my machine, BlueSoleil assigns the port COM11 to this device. 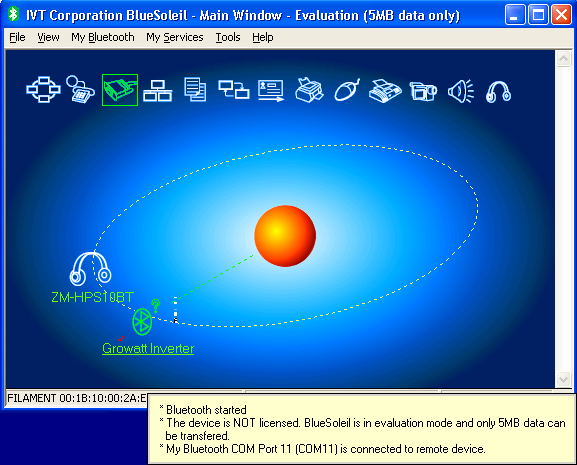 BlueSoleil before and after connecting to the Serial Port Service to the DB9 to Bluetooth adapter (called “Growatt Inverter” above). Click to zoom. You should now be able to talk to yourself even more than usual by opening up another HyperTerminal window connected to the BlueSoleil COM port and tapping keys into it, which should appear on the HyperTerminal connected to the DB9 adapter COM port, and vice versa. That àøæ at the end is HyperTerminal/PuTTY not being able to deal with changing linespeeds. Try reconnecting using 9600bps and everything should be right as rain a bright, electricity producing day. If you don’t do that, be prepared to spend a couple of entertaining hours with portmon and on websites containing pages titled ‘Adventures In Bluetooth‘ trying to discover why the next bit doesn’t work. Now we want to test connecting the inverter by Bluetooth. You’ll notice the Bluetooth to DB9 adapter is still connected to the Inverter via a cable and the null modem adapter, and is powered through an external 5V USB. This is the part that probably won’t work, so why not fire up portmon (from SysInternals) anyway and watch the bits fly over the air. 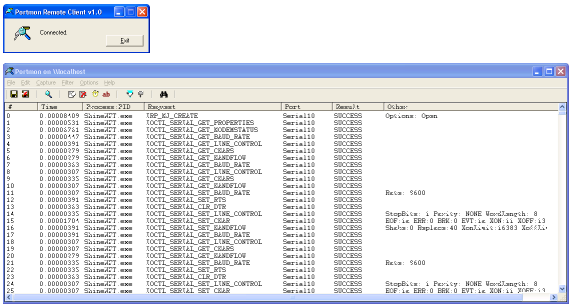 69 0.00000391 ShineNET.exe IRP_MJ_READ Serial2 SUCCESS Length 27: #?.2D………..F…..3…. 89 0.00000335 ShineNET.exe IRP_MJ_READ Serial2 SUCCESS Length 29: #?.2B…………@…9….3..
123 0.00000335 ShineNET.exe IRP_MJ_READ Serial2 SUCCESS Length 43: #?.2A#..J………………………..q…. 146 0.00000363 ShineNET.exe IRP_MJ_READ Serial2 SUCCESS Length 43: #?.2A#……P…………………….q…. 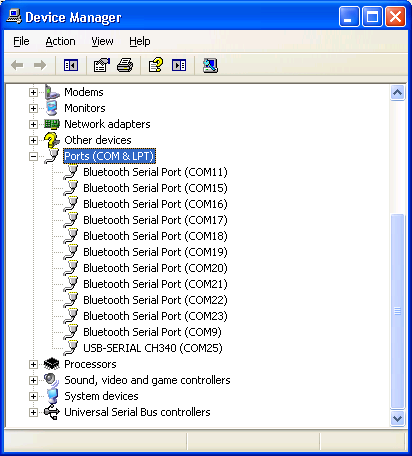 portmon has the ability to save logs of your COM port communications, so when things go pear-shaped, try grabbing a trace of a successful connection (over the wired serial cable) and the unsuccessful connection (over bluetooth), and compare and contrast in your favourite text editor or comparison tool. The trace above shows what portmon gives me for a successful connection to my inverter, if that’s of any use whatsoever. So for this test, fire up ShineNet again, give it the COM port address assigned to your (now remote) Bluetooth/RS232 adapter in BlueSoleil and, with any luck, you’ll get some more stats flowing over the air. Configuration 4a gets us a bit closer to how this thing should typically run. Righteo, now it’d be nice if I didn’t have a 5v power adapter plugged into the side of the DB9 to Bluetooth adapter, since the whole purpose of using bluetooth was to get this working wirelessly, which kind of defeats the purpose if I’ve got an extension cable connected to the adapter outside the house. I have it on good authority that it’s possible to power this adapter directly from the inverter, using current on pin 9 of the DB9 connector. Try flicking the switch on the side of the adapter from ‘USB/Battery‘ to ‘DB9 Pin 9(5V)‘ and then be amazed when the lights go out and it ceases to work. This is because the cheap-arse null modem you purchased doesn’t actually have a pin 9. Go on, check it. Check it twice. Isn’t that fascinating ? Yes. Yes it is. One of these things is missing pin 9. So as a workaround, use that DB9 M/F null modem you definitely purchased weeks in advance instead, and a DB9 M/M gender changer so that everything’s boy/girl/boy/girl from the bluetoothy adapter to the inverter. This is where I’m up to at the moment, so this probably be revised in two weeks or so when the new null modem turns up. That presumably works first time, so rip out the cable, put the bluetoothy adapter in a plastic bag so it won’t break the first time it rains, replace ShineNet with something that doesn’t look like as if it was written by the solar panel guy’s son over the course of a weekend, and there you go. Have you learnt nothing ? Of course it’s not going to work. You’ll probably find that the ebay seller just skirts a day short of their paypal-guarantee window and you receive the DB9 F/M null modem adapter exactly 30 days after you order it. Because life is meant to be spent waiting for other things to happen. Close the paypal dispute when the package arrives. Break the adapter out of it’s bubble-wrap, attach it, turn everything on, and be amazed when it still appears to work. Flick the switch to get power from the DB9 line, and lo and behold, the power does flow, but the ones and zeroes that comprise the solar panel data don’t appear to make it to the bluetooth receiver on the laptop. So that’s annoying. So it’s about this time that I receive a comment on this post through the absolute shart load of spam that I receive asking whether I should have the bluetooth thing in slave or master mode which gets me flicking through the specs sheet for this thing again. And what do you know, that DTE/DCE switch thing on the left hand side actually swaps the transmit/receive lines for you, meaning I didn’t need to get a separate null modem adaptery thing at all. Now that the device is noticing what it’s dip switches are set to, flick the Master/Slave ( M / S ) dip switch to ‘ S ‘, and (this is the exciting part) the DCE(F) / DTE toggle on the side to DTE . You can now remove the (possibly not working at all) DB9 F/M null modem adapter that took four weeks to arrive from the chain of doodads, and still get something that could be described as vaguely functional. I shall leave replacing the laptop with a raspi, and replacing the ShineNet software with something else completely for another thrilling installment. Stay tuned, Solar Warriors. Attention retail giants: I am prepared to say anything here for the right kind of incentive. And by incentive, I mean cash. and if you’re old enough to be putting solar panels on your house, you’re old enough to remember Hayes commands. Take a few moments to reminisce about the thousands of different modem command variants that used to exist. Ahh. Isn’t it wonderful that you’ll never need to know any of that again. Although to be fair, these inverters are starting to have wifi built-in now, so all of this will probably be obsolete in a month or two. Enjoy ! I noticed you flicked the switch from Slave to Master, yet when you viewed the settings, it display Slave. If you want to use the DIP switches on top of the adapter then you need to first enable these. You do that by sending the command DIP=Y in Tera Term; this will enable the two DIP switches. The DIP switches can be a convenient way of switching between Master and Slave mode. Did you intend to set the adapter as Slave or Master? Yeah that’s a valid question. I guess out-of-the-box the adapter is configured to ignore the DIP settings (DIP=N). I’ve switched it to Slave and enabled the DIP settings (DIP=Y); details are in the post above. I have a copy of the last shinenet software release ver 2.1.1 if you’d like me to send it to you. The hardest part about the software is getting past the default password, no mention of what it is in the manual. After many frustrating hours it was ‘123456’ hope this helps someone. Why not just use the PV Beancounter V2? Needs .net and is also windows based, but works better than ShineNet. All their files / software is readily available on their FTP site. Hmm.. Just tried now and I can log in (which is further than I could get before), but there’s still no files available for download (it’s just an empty folder). Hi Greg, I wonder if you ever attempted and succeeded at connecting to pvoutput…. so many have tried with a rs232-bluetooth to laptop/pc connection and failed. Most can get the bluetooth part working but no data upload to pvoutput. Thanks for the info about pin 9. I’ve hooked up an esp8266 and a ttl to rs232 converter. My inverter is a mtl4200 and can talk modbus so it was possible to talk to it via an Arduino library. Ive programmed some code to upload to pvoutput.org every 5 minutes and also to a local open energy monitor emoncms instance. After reading about your pain here, and it has been entertaining for me to read, I am going to stay with SMA and SolarEdge inverters.